Back cover blurb: Edwardian England, aeroplanes are a new, magical invention, while female pilots are rare indeed. When shy Della Dobbs meets her mother's aunt, her life changes forever. Great Auntie Betty has come home from Kitty Hawk, North Carolina, across whose windswept dunes the Wright Brothers tested their historic flying machines. Della develops a burning ambition to fly and Betty is determined to help her. But the Great War is coming and it threatens to destroy everything - and everyone - Della loves. 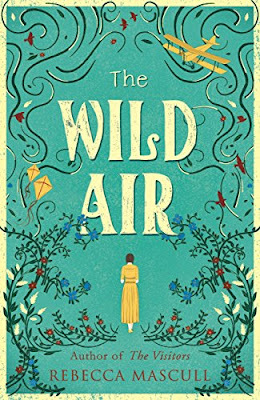 Uplifting and page-turning, THE WILD AIR is a story about love, loss and following your dreams against all odds. The Wild Air is Rebecca Mascull's third historical fiction novel, and I think my favourite so far. Mascull is such a masterful storyteller that it is so easy to believe that you are in there in prewar WWI Britain with Della Dobbs as she tries to make her way in the aviation world. Della Dobbs is a shy, timid young girl, until her Great Auntie Betty comes to visit the family from America. As she describes all sorts of wonderful things, Della concerns herself with one thing only, the world of flight and flying machines that her Aunt introduces her to. As the pair begin to build kites together Della knows that she put her talents to greater use. She wants to fly. And then she meets a boy at the beach. Rather than scorning her for her hopes and dreams, Dud admires her kite and encourages her. Her gives her his already well read copy of Aero magazine and secretly via her Aunt promises to keep in touch by letter. As Della and Dud's friendship blossoms, Della's collection of Aero magazines grows steadily and her dream of one day being able to fly a plane intensifies. Her Father is against it. He has never much liked Betty anyway, so her encouragement of Della's dream gives him a reason to ban her from the house. Della, used to her fathers dark moods, pays little attention to his rules and continues to pursue her dreams. Della's dream becomes realistic after visiting an air show and finding a flying school willing to take in a female pilot. No easy feat! But with Aunty Betty's help, Della is finally taken seriously. However, finding a school with an instructor willing to teach a female pilot is just the beginning of Della's journey. But she is young, determined and won't give up without a fight. The Wild Air is a glorious novel. Mascull's research is meticulous, her attention to detail and her Author's end notes showcasing her dedication and talent. The Wild Air is avaialble via Amazon online and all good book shops. Thank You to the publishers who provided me with an advance proof copy in exchange for an honest review.